The Portable Folding Light Box suits for shooting small products and will work excellent anywhere and anytime. It is recommended to used as a temporary studio for its excellent easy-to-use feature and premium portability. • Matte surface, let the diffuse light reflection well-distributed. and then the product have more dimensional sense. 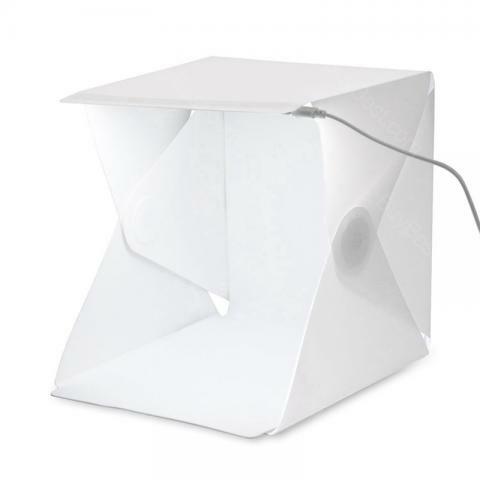 This bright box is smaller than it appears so if your using it to photography anything small (jewelry sized staging) then it's optimal. The "backdrops" are foam but shoot well with DSLR or iPhone no problem. For my minimal purposes this will do for now. If you're a photographer and you like to do macro work in a simple studio environment bright box is for you. No hassle with lighting and wires, just set the box up and photograph. Perfect for travel and can fit nicely into a laptop bag or shooting bag, even some DSLR camera bags to be honest. For the price the quality is good. I recommend. Will be good for Instagram and Etsy style product photography. Amazing product.Bright Box is the coolest thing I've bought in a while I love it! the light is nice and bright so it made it easy to focus my lens and it did t really cast much of a shadow which is awesome! I'm using my phone to photograph, I have to actually put it in the box and move the item to one side or other, and I have to crop out the corner gaps. However, for the price and ease of use - no more shadows! I'm very happy.